What will you do in one day? 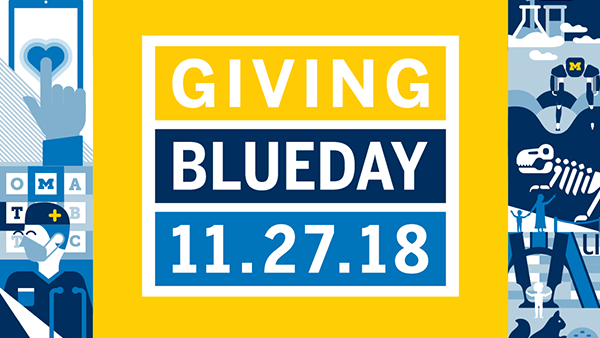 Tuesday, Nov. 27, marks the University of Michigan’s fifth annual university-wide day of giving called Giving Blueday. Coinciding with Giving Tuesday, a global day of giving following Thanksgiving weekend, Giving Blueday is a day for everyone who loves U-M to join together to combine their support and maximize impact. Last year, more than 8,200 donors from around the world gave $4.4 million to support what they love about the University of Michigan, and this year, your donation can go further. New day-long and hourly challenges for first-time donors, students, faculty, staff, and more can increase your gift with matching funds. Check this schedule for more details. Why give to the Office of Academic Innovation? The work of our diverse and multifunctional team shapes the present and future of learning through an expanding portfolio of online learning experiences, by personalizing the residential learning experience, conceptualizing how the university engages with the public, and much more. Your gift supports our pursuit of transformative innovation in higher education and for public good. We launched Michigan Online earlier this year to broaden the impact of the University of Michigan’s mission to develop leaders and citizens who challenge the present and enrich the future by making our elite public research university’s learning experiences accessible at scale. 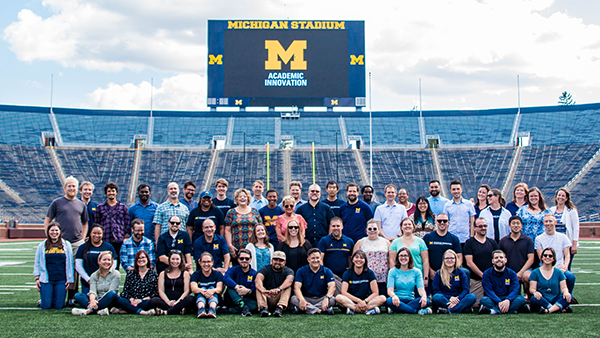 Our teams work directly with faculty and community collaborators to develop a broad – and growing – catalog of online learning experiences available through Michigan Online. These courses, series, and Teach-Outs have generated nearly 7 million enrollments and have reached lifelong learners in more than 190 countries. We are also working with partners in the School of Information and School of Public Health to develop two online graduate degree programs, starting fall 2019. We are honored to provide the U-M community with the lifetime benefit of Michigan Online learning opportunities at no cost. If you are a student, alum, faculty member or staff member on U-M’s Ann Arbor, Dearborn, or Flint campuses, you may earn a free certificate when completing more than 100 faculty-led online learning experiences available through Michigan Online. Your gift this Giving Blueday supports this growing portfolio of online learning experiences and a lifelong benefit for the U-M community. Gifts to the Office of Academic Innovation also support our teams who create and iterate upon digital educational technology tools in support of residential learning across campus and beyond. To date, more than 43,000 U-M students and 85 percent of U-M undergraduate students have used at least one tool supported by our office at some point in their academic career. These tools (ECoach, Gradecraft, M-Write, Problem Roulette, Viewpoint, and ART 2.0, to name a few), are also used at more than 90 schools, peer institutions, and community organizations. Our office is also playing a leading role in conceptualizing public engagement to create opportunities for our campuses and public communities to partner and learn from each other. Need a “quick win?” We also recently announced new “quick win” research grant funding to enable research projects on special topics in higher education and academic innovation to get the support they need to get off the ground. See what else we’ve been up to this year in the Academic Innovation blog. Gifts to our office allows these initiatives to blossom and enables faculty and staff to create new online learning experiences, design and scale new learning technologies, and use learning analytics to create personalized learning opportunities for U-M students and lifelong learners around the world. Need a little extra motivation? No matter the size, your gift today will support our work in the pursuit of a more peaceful and equitable society through personalized, engaged, and lifelong learning. Give to Academic Innovation.